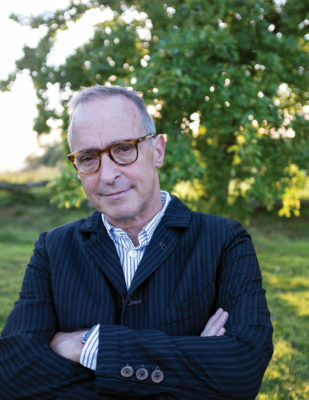 The urgency of gastrointestinal distress has never sounded as delightfully funny and articulately spoken as it did Wednesday night, when David Sedaris presented a never-before-read essay to an eager audience at Boston Symphony Hall for an appearance for the Celebrity Series of Boston. Some stories were lengthy, traversing the peaks and valleys of emotion across a spectrum of personal memories; others, no longer than a sentence or two, contained such viscerally, hysterically funny twists that a guffaw felt like the only appropriate response. He was, at times, delightfully crude and borderline grotesque. In his descriptions of gastrointestinal distress and expletive-laced insults, he seemed to take great pleasure, filled with gleeful satisfaction after every audible cringe from the audience. It almost felt as if he was playing a game, trying and succeeding to appall and endear the audience until some were nearly rolling in the aisles with laughter. Other authors on tour may perspire and appear visibly distressed by the pressures of reading their sensitive works to attentive listeners. Not so for Sedaris. Although perhaps not expressing his joy as audibly as one “hoot-and-hollerer” from the orchestra section, he seemed to be having fun seeing just how much he could get away with saying. And yet, the less-than-prim material in some of his stories was far from unsettling. Wildly raunchy as a few selections were on Wednesday night, each of the pieces skated past off-putting territory and glided into almost heartwarming relatability. Even in an ornate theater like that of Symphony Hall, amid leather seats and chandeliers, Sedaris’ articulated narratives on diarrhea and wildly extravagant curses didn’t feel out of place. It may perhaps be attributed to his unassuming performance style. Sedaris did not pace across the stage, nor did he shout into his microphone. To see him lean back in a devil-may-care slump against the stool that held his water would have been completely out of character. Instead, standing behind the podium and shifting only to remove his suit jacket, Sedaris spoke with the cadence of a soothing audiobook. His gentle demeanor, even when elaborating upon the discomforts of a stomach virus or stepping on a nail, felt as if he was a personification of the thousands of pages he has written. To see an author so similar to the works he writes is reassuring experience — as consistent and metered as his tone was, Sedaris glowed with ingenuity and empathy. With that empathy is a gift for the craft of storytelling and oration that made added dimension to his already engaging accounts of everyday life. Sedaris manages to stumble upon the most extraordinarily funny situations that it seems his destiny to observe his surroundings. His musings about his surroundings are so witty and wonderfully crafted that it’s nearly impossible to avoid laughing to tears. In hearing his words out loud, by the author and as they were intended, one can’t help but feel grateful that Sedaris has chosen to share his experiences with an audience. With over a dozen books under his belt, the author is a decisively literary humorist; yet, in performing, he transforms already extraordinary writing into a listening experience worth having. Some of Sedaris’ readings, as with many of his written essays, were underscored with serious material that carried a much more somber tone. That is not to say that hearing him speak of his father’s old age or mental illness was sobering or upsetting. His ability to balance critique and reflection with sentimentality and biting humor softened the the hard edges of his memories and dulled the sharp edges of brash statements. This is where he truly excels as a writer and reader. Every transition from nostalgia to criticism is an adept skip or jump from laughter to distress on an emotional hopscotch. His skill granted him license to make offhand comments and premeditated musings with cheeky pretentiousness that might stem from his sharp-has-a-needle sense of humor. And in delivering snide remarks on economy-class fliers and his father’s gym reputation, Sedaris delivered some of his funniest jabs of the evening. Part of what made the reading so downright fun — and what makes reading his books so enjoyable — is that Sedaris has the ability to articulate our most critical and judgmental thoughts as comical reflections and biting critique. But he also has empathy and sentimentality that stitches each story, each sentence, each word within the sentence altogether. Sedaris’ reading on Wednesday was an amusing one, certainly, but comforting and humbling, too. With such consideration and kindness, one might hope to wrap themselves in his words and never leave their embrace, snug and scratchy as it may be.